Sometimes your feast can benefit from a bit of natural style. Our Olive Grove Fine Dining Collection is a tasteful array of accents and elements that are perfect for not only bringing a bit of nature to your table, but also giving a peaceful and tranquil style to your eating arrangement. This way, you can easily add both beauty and harmony to your table. This collection is inspired by the olive grove. In ancient times, the olive had great symbolism, embodying peace and various other positive aspects. In the modern day, we revive some of this symbolism in a variety of accents and decorations for your table, as well as in a number of functional elements to have in your kitchen. An olive tree candelabrum offers incredible detailing and lighting to your decor, while a matched serving tray and salad serving set offer plenty of versatility, allowing you to serve meals that match your dining theme. Subtle and classic, the elements you will find here in this Olive Grove Collection are perfect for accenting a variety of different themes and styles. So if you need something natural to go on your table, take some time to browse through this inspired collection of fine dining feastware. 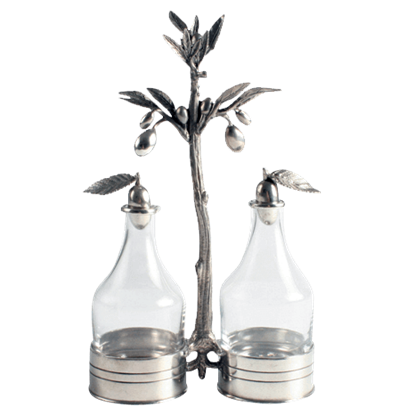 A delicately detailed, pure pewter olive branch, laden with fruit and leaves, is the focal point of the Olive Grove Oil and Vinegar Server. The charming set makes a great choice as a necessary table piece for your next dinner. 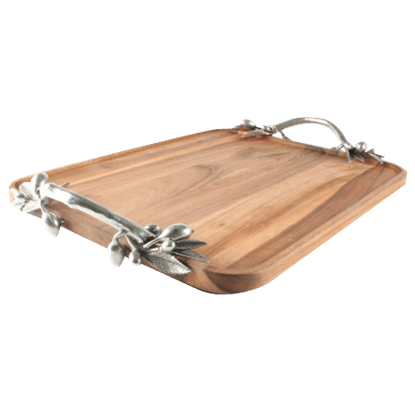 The large, rectangular Olive Grove Serving Tray features rare, lustrous, water resistant acacia wood and charming pewter handles. The banding of the wooden board is a property unique to acacia wood and looks beautiful to the eye. 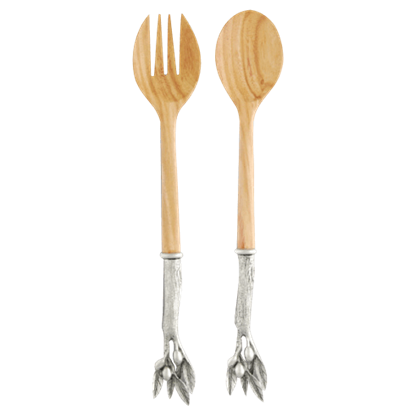 A warm contrast to whatever greens you decide to put in your salad, the Olive Grove Salad Server Set looks great as it transfers any number of delicious salad recipes to your plate. This salad set is both functional and beautiful. 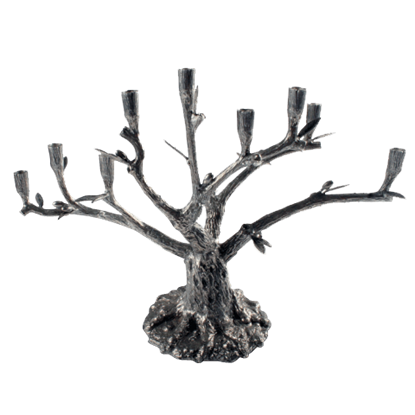 Combining the beauty and symbolism of the olive tree and glow of candle light in its design, this handsome, detailed Olive Tree Candelabrum fills your home with cheery light and tranquility during any time of the year.